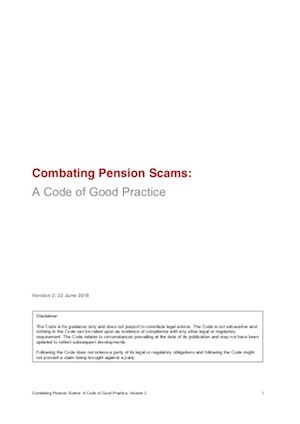 The PLSA is pleased to support the Pension Scams Industry Group’s publication Combating Pension Scams – a Code of Good Practice, which sets out practical steps that pension scheme managers and trustees can take to protect their members from scams. Whilst the code has no statutory basis, schemes have been adopting its guidelines since it was launched in 2015, resulting in the prevention of thousands of transfers to unauthorised arrangements and saving many people from a likely loss of pension savings. The Code was revised and updated in June 2018.